In the movie the cowboy takes his last swig of water from his canteen, his lips are parched and he turns his water bottle over in desperation—empty. Vultures circle the dying rancher, the hot sun high in the sky, his demise is written in the dust. Soon he will be picked apart by the hungry, menacing predators with wings. It’s true; vultures are a clean-up crew. They live mostly on carrion, dead or dying animals. Occasionally they may wait for an injured or sick creature to die. They patiently wait their turn. This ritual is necessary for many reasons. If the carrion is not eaten, it goes through a slow rot. The carcass will begin to smell and when decomposition is underway, they stink. It’s possible the dead animal may pollute water. It will definitely attract flies and disease carrying bugs. The vulture generally does not make a fresh kill but removes waste from the environment. In fact, sometimes they are the last feeder to arrive. In every habitat one or more vultures makes a home. They generally hang out in communal groups. There are two basic kinds and although related, they are really quite different. One kind, the New Worlds, is indigenous to the Americas: North America, Central, and South America. They are related to storks and condors—in the family of seven Cathartidae—and that is evidenced in the fact that they have no sharp talons. The New Worlds however, not only belong to a different and huge family (250 species)—Accipitridae—they are found in Europe, Asia, Australia and Africa. Related to hawks, they have sharp talons, will kill injured animals occasionally and in this group are also eagles, buzzards, goshawks and kites. Both New and Old World share a similar featherless head, generally of large size (some up to 30 lbs. or 13 kilos), a perforate nasal septum (explained below) and both have tremendous soaring ability and keen eyesight. The Old World vultures lack a sense of good smell that some of the New World vultures, who can pick up smells in the air current, whereas the Old Worlds have to rely more on finding carcasses by sight. One of the reasons they are great fliers has to do with physics. They are mostly great gliders. Vultures have a tremendous wing span of almost six feet (approx. two meters). With these huge wings, they hitch a ride on thermal warm air currents. If you watch them over fly over a dead animal, such as on the African savannah (grasslands), where they might be eyeing up a dead elephant for dinner, you will see that they strategically use their wings to circle and glide closer, then when they are ready to drop, they will thrust their sturdy legs somewhat forward and cocked in time for a touchdown. Vultures cannot sing like other birds but they perform hisses, wheezes and crackle noises and they are especially noisy when struggling with others to feed. Vultures in a pack, sometimes hundreds together feeding, are called a scrum. Even a quick examination of a vulture will tell you they have long featherless necks; the better to stick inside a body casing. Also a feathered collar helps to keep blood from running down their backs and onto feathers making them sticky and unworkable. Another nice feature is that vultures have what’s called a nasal septum perforation—in other words, a hole in their nose. Yes, you can see right through a hole in their nose to the scenery. The best reason for this is the ability to keep their nostrils open and clean. They would falter if a piece of rotten meat got stuck inside creating a sinus infection. In addition, air passes through the perforated nostril allowing smell molecules to pass into the senses. Their feet are assets too. They have long toes and their talons or claws are short or blunted, allowing them to walk. And vultures have a hind toe similar to a thumb. Some vultures will walk onto their food when feeding, others do not. Their hooked beaks are made of keratin like our fingernails, only denser and sharper. These allow them to tear pieces of food off the whole. This may sound, well, yucky, but vultures’ legs are coated with dried, white uric acid, excrement that they have doused themselves with. It serves good purpose however in that in hot weather this coating cools their body temperature and since they may have stepped in blood or contaminated flesh, the acid in their urination will kill off any bacteria that accumulates on their legs. The can eat even the most rotted meat and sidestep disease that would kill any other animal because their stomach acid is so caustic it kills off viruses and bacteria. They have been known to eat meat infected with Botulinum toxin, hog cholera, and anthrax bacteria, deadly microbes. And vulture blood is packed with antibodies. After a meal their bellies and chest will appear extended because there is a food storage sack inside their body that bulges the chest out after feeding. This makes him too heavy to fly, so he will either settle in to watch others or attend to bathing. Dense material can be digested in 24 hours. If threatened they can vomit the entire stomach contents for quick flight. It is their habit to wash off blood and preen their feathers, which have a kind of hooking mechanism—like small branches. These branches come unhooked with rubbing against others for food, and the preening ritual “zips” up the feathers again. You will see them pull the feather to clean and preen it. The vulture is a metaphor for greed. A symbol of rapaciousness. The term vulture is used as a metaphor for those who prey on the weak or dying. They are thought of as unclean, Charles Darwin called them, “disgusting” and it is always the last in line to feed. The Egyptian vulture however has a cool trick with using a tool. It picks up a stone in its beak and drops it onto an ostrich egg shell until it breaks—not so dumb. In history, rituals of pre-Columbian cultures had favorable images of vultures and they were occasionally depicted as a god with a human body and a bird head—and were used as a messenger who carried important transmissions between humans and gods. Florida turkey vultures nest in a dead tree perch and dozens share one tree. Nearly every branch is occupied. Group roosts are called communal, and a mated pair may live nearby in a dense thicket. The female vulture lays two oval, hand-sized, creamy white and brown spotted eggs. Funny, but both parents take turns sitting on the eggs to keep them warm while chicks develop, about 40 days. They will take care of them after hatching because chicks cannot regulate their body temperature or find food. A reproduction problem is that vultures don’t reach sexual maturity until five to seven years of age. And there is only one chick every year or two and 90 percent of their young die in the first year. Over the next half century vulture numbers on the continent are projected to decline by 70 to 97 percent. Vultures are in danger of disappearing. According to a new report from University of Utah biologists, such a loss would have serious consequences for ecosystems and human populations alike. The rapid population shift from rural to urban in parts of Africa has displaced vultures from their habitat. A massive growth in wind farms across the continent —the birds often collide with the turbines. 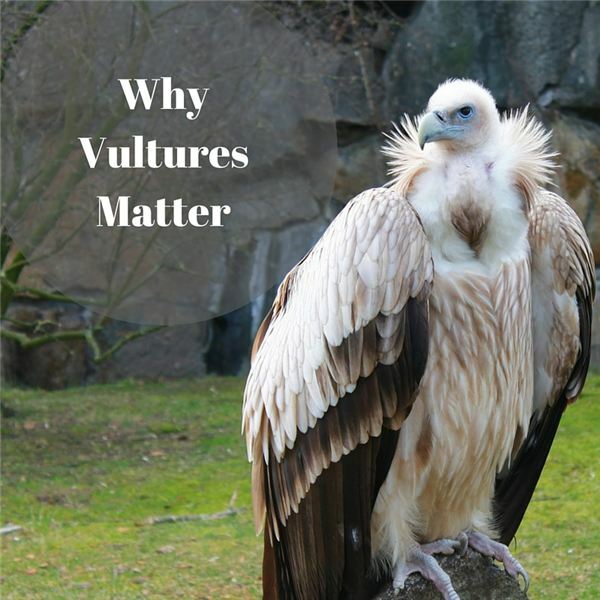 The primary threat to vultures, according to the report published in Biological Conservation, is the presence of toxins in the carrion they consume. Hundreds can feast on a carcass that has been poisoned. Populations of most vulture species around the world are now either declining or on the brink of extinction. Biologists Evan Buechley and Çağan Şekercioğlu suggest several inherent ecological traits also contribute to vultures’ extinction risk, including their large body masses, slow reproductive rates and highly specialized diets. The greatest external threat to vultures, however, is poisoning. Poisoning occurs in California from toxic lead bullet fragments in gut piles of animals left behind by hunters. In India in the mid-1990s, the cause of the vulture decline was from diclofenac, a veterinary anti-inflammatory drug that relieved pain in cattle, but proved highly toxic to vultures. Today sub-Saharan Africa has a vulture crisis. Natives are using potent newly affordable poisons are used to control predatory pests, such as lions or jackals. These toxic chemicals work their way through several ecosystems of birds, mammals and insects. Poachers also poison carcasses so vultures do not pinpoint locations of illegally taken animals. If vultures are not there to clean up the mess, others species arrive such as dogs, rats, mice and crows. When these animals dominate, bad things happen. To begin, changes in animal populations create an unstable balance of “food webs”. Since vultures rarely come into contact with humans and dogs may, the potential for disease is high. According to health reports, India experienced a strong uptick in feral dogs—by an estimated seven million. The increase in dogs, potentially feeding on disease-ridden carcasses, is thought to have at least partially caused the rabies outbreak that was estimated to have killed 48,000 people from 1992-2006 in India—deaths that may have been avoided if not for the disappearance of vultures. Markle, Sandra. Vultures: Animal Scavengers. Minneapolis: Lerner Publications Company, 2005. Book. Barrett, Norman. Birds of Prey. New York: Franklin Watts, 1991. Book.